GMV² firm was established in 1998 by Daniel LEBARD and Pierre JULLIEN, both gains their own experience from the general management of projects or companies in strong mutation. 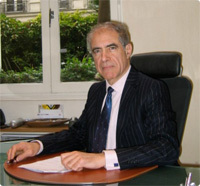 Pierre JULLIEN is the present managing director. Pierre JULLIEN is a manager for a better change. Former pupil of the Ecole Normale Supérieure (Ulm –aggregation of mathematics and master of physics), the Institute of Political Studies of Paris and the National School of Administration, he began his professional life in the Administration by launching and leading the first program of an overall redevelopment of housing areas, the Habitat program and Social Life (more than 100 000 dwellings). Then, within the direction of the Havas agency, he has led the reorganization of the agencies network in view of the opening of the group to international market and to new communication experiences. Then, as secretary-general and managing director of Sacilor group, he steered the implementation of company restructuring for the French steel industry in 1984 and organized the merger of the two groups Sacilor and Usinor, which has resulted subsequently in the creation of Arcelor. Thanks to that experience, he gets a real expertise in the management of highly innovative projects or companies that are constrained to evolve in emergency situation. That how the idea came to create GMV² that he continues to lead. Moreover, he is the author of a number of reports and surveys (for the Department of Equipment and Transport, the National Union of Federations of Organizations HLM, the Ministry of Research, the National Institute of Audiovisual, Accor Group, …) and has taught at the University of Créteil, the National School of Administration, the University of Paris Dauphine. He also participates in the promotion of the French technology in China, especially in the cyclotrons area, and organized a seminar between the CERN and the Academy of Sciences of China in Canton on this subject.